From SEO to Digital Marketing, use AS Creative Services to analyze and optimize your website. 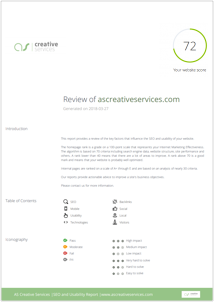 Our free SEO report checker will help you understand and improve the criteria necessary for good SEO. With our in-depth website analysis SEO Checker learn how to improve your website rankings & online visibility through SEO, Social Media, Usability and much more.